Tea & Tango has a new website! 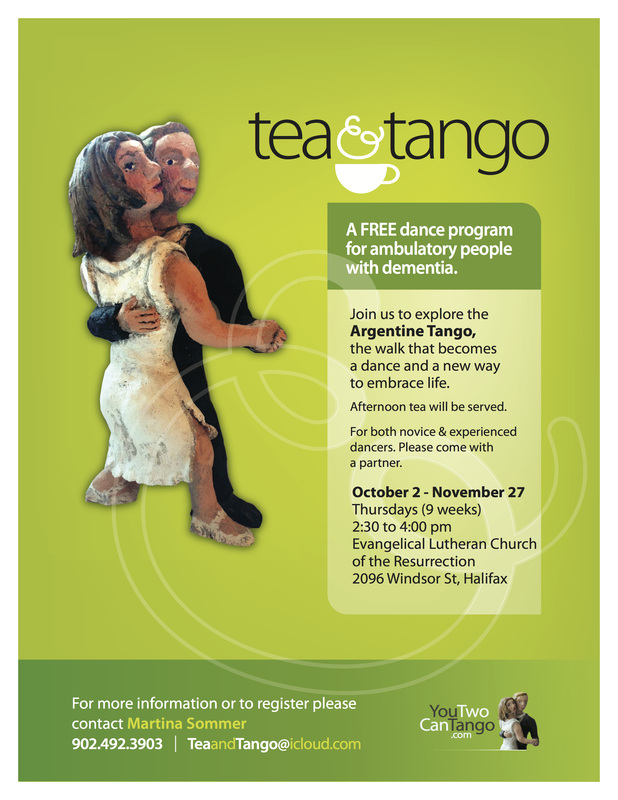 Tea & Tango for people with neurological Conditions continues! What started as a pilot program in fall 2013 - please see earlier posts - is now a community based program thanks to Ft. Massey's community outreach! 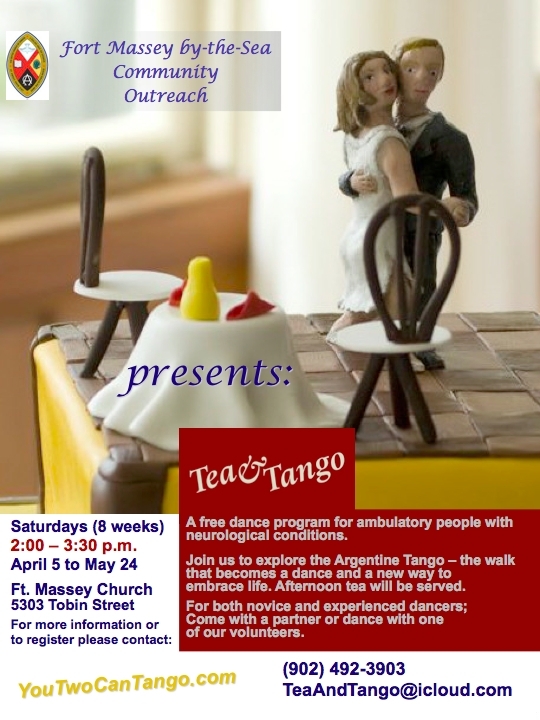 We are looking forward to "old" and new participants joining us on Saturday afternoons, 2 - 3:30 pm, learning the Argentine Tango and connecting not only on the dance floor but over a cup of tea & yummy cookies. The sessions are free, donations to the program are gratefully accepted. Thank you for your support. Registration is necessary, no drop-ins. Classes are progressing, please join us no later than April 12th. Please contact us with questions, we look forward to hearing from you! Are you interested in learning a new dance while supporting people with health challenges? We had a wonderful time in fall with many of us feeling this program being the highlight of our week! Requirements: Physically fit to support others with balance issues, curious and positive, feeling comfortable with being physically close with others. More details can be found on the poster - please call us with your questions: 492-3903. Thank you for your support - this program is not possible without you! Volunteering at Tea & Tango has certainly improved my understanding of the abilities and challenges of people with Parkinson's Disease, as I had not previously met anyone who had it. I was surprised that the rate of progress among those with neurological diseases did not seem to differ significantly from standard introductory dance classes. My experience with the group was overwhelmingly positive, and a highlight of my weekly schedule. As a result I will be on the look-out for other opportunities to volunteer in a similar setting and role. Photo gallery compliments of Hamish Gordon Photography! 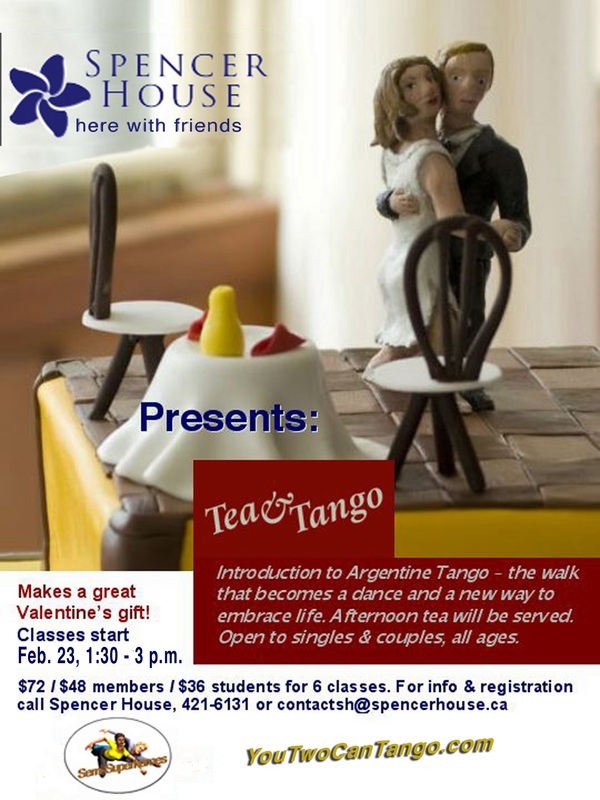 Come and join us for this new edition of Tea & Tango where we learn the basics of the tango walk, both roles - leading and following regardless of gender - while sharing stories over a cup of tea with a new friend. We embrace learning in an intergenerational setting with a strong sense for connecting with each other and adapting to each other, just like when we dance the tango. The benefits of Argentine Tango: Improving gait, posture, balance and coordination while dancing with the music in a gentle embrace....it feels so good! The format will be 45 minutes class, followed by a tea break and open dance practice. Saturday's experimental workshop adapting Argentine Tango to a mixed group of wheelchair users and their dance partners was absolutely amazing. We had so much fun - laughter and music guided us to try the tango walk, rock-steps, ochos, ganchos, low boleos and dancing apart like Gustavo & Giselle Anne. Each dancing couple discovered different ways to lead and follow certain moves and shared it with the group so everyone could try it out. Can you imagine how many creative ways there are to adapt the tango to individual abilities? Thanks to all the inspiring participants & volunteers - you gals & guys rock. One more thing: Everyone would like to see wheelchair dancing in Halifax as well as in summer camps! Let's do it! 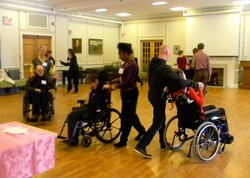 Please get in touch with us - we would like to bring more dance on wheels to Halifax! I just wanted to say thank you for inviting me to be a part of such an incredible opportunity. I have always enjoyed watching people dance and have always wished I could be the one on the dance floor, and you and all of your fabulous volunteers gave me that opportunity... it was truly a dream come true for me! I had such a wonderful time meeting everyone and participating! 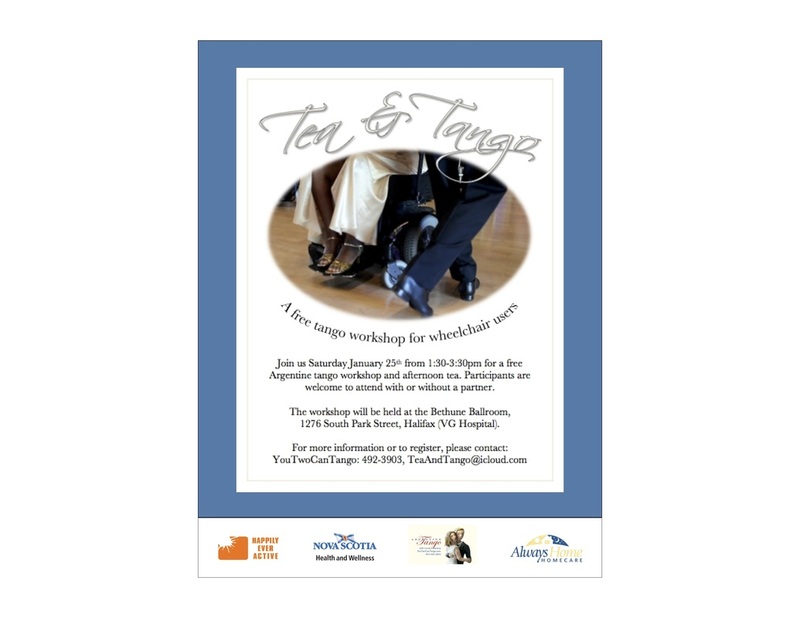 Join us on Saturday, January 25th for a free Argentine Tango wheelchair workshop at the Bethune Ballroom, VG, from 1:30 - 3:30 pm. If you are interested in offering a tea & tango program in your community or have any other questions about this program or setting up a dance program for health and outreach please contact us at 902-492-3903. And here is the video, evening news, Nov. 18th. We have collected a list of links that refer to articles, research papers and other interesting resources informing about the current understanding of Argentine Tango and dance in general in regards to health and well-being. Argentine Tango - scientific research, a selection. You can find more information in the reference section of each paper. Links to news articles, blogs etc. Tango therapy: The healing embrace.